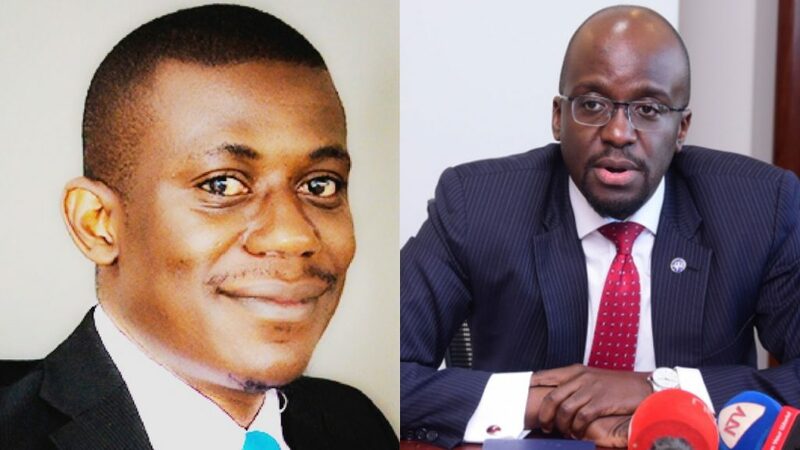 Blogger Seruga (L) says Mpanga picked $5,000 from DFCU on an invoice marked “Fake News Campaign”. 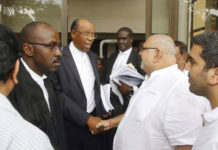 In the $5,000 (about Shs19m) invoice was addressed to DFCU’s Head of Legal services, from Mpanga’s Bowmans law firm. The money was to be paid to AF Mpanga Advocates’ DFCU account on receipt of the invoice. 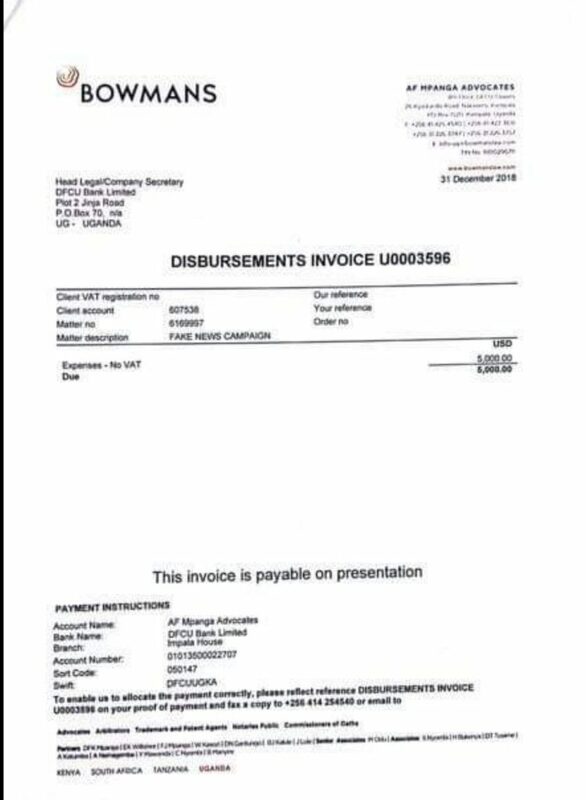 A copy of the invoice Seruga published on Facebook. 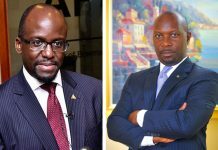 In a bid to fight this negative press, DFCU termed the reports as fake news despite being supported by credible documents and a counter plan was hatched with some online websites trying to paint a rosy picture for DFCU. 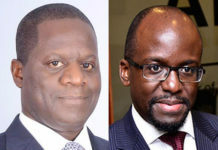 Meanwhile, in December 2017, the Commercial Court disqualified Mr Mpanga and Timothy Kanyererezi Masembe of MMAKS Advocates from representing anyone against Crane Bank as they were conflicted, having previously represented tycoon Sudhir Ruparelia a former Crane Bank shareholder. 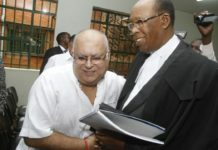 The lawyers were thrown off the Shs397bn Crane Bank and Sudhir Ruparelia’s case against Bank of Uganda (BoU). 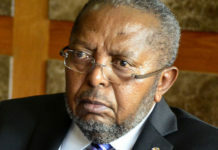 In his ruling delivered on December 21, 2017, the head of the commercial court division, Justice David Kutosi Wangutusi stated that Mpanga and Masembe acted in violation of the Advocates (Professional Conduct) regulations. 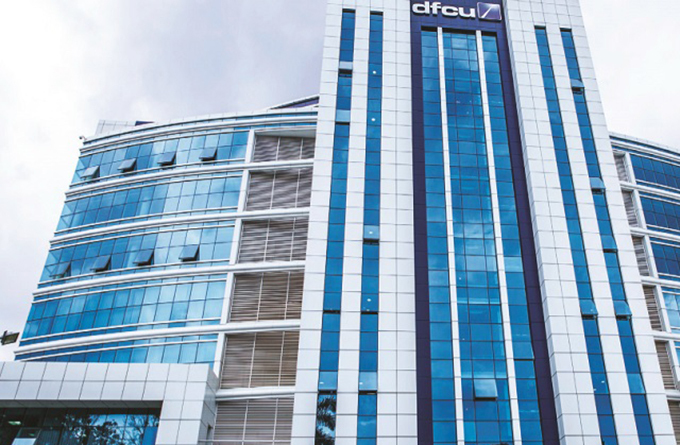 The DFCU headquarters in Nakasero. 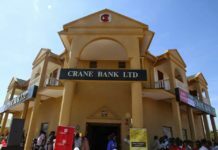 As Parliament’s Committee on Commissions, Statutory Authorities and State Enterprises (COSASE) winds up its BoU probe into the closure and sale of seven commercial banks, DFCU has come into the spotlight over several illegalities in the way they acquired Crane Bank in January 2017.